Sry folks on the late posting of news. x.x I've been busy lately. Anyways here are more news of BT11 and also tips and my comments about it. Here is our new section of the blog. A tale of two cards. So what's it all about? We will compare and contrast cards with similar effect. Here is our 1st tale. What?? CounterBlast 3 + 2 criticals and retire everyone's front row? However it came with a heavy price of discarding 3 cards from hand. Is this card strong? I can't give a definite answers but i can share my opinions on it though. After all it is a game full of opinions where there is no definite build in anything. Lets make a comparison with Reijy. 11k vs 10k. Seems that armor break has better defense based on its attack and not too easily ramped down by cards. How bout its card effect? Retire all frontrow rearguards on both sides of the field. It can be a double edged sword to use it and has to be timed properly for it to be effective. How to minus your self with this effect will when your opponent has no rearguards in the frontrow and you have a full field with little cards in hand. That is a -5 for yourself. So when is the best time to use him? Its when you have 1 or no rearguards and opponent has a full field with a small hand size. This way, you pressure him with a 21k+8k boost with 3 criticals to guard no matter what. Not to forget he would not have any units to intercept as well. Best situation would be a double critical trigger check and your opponent knows he can concede. How bout Reijy? Many people said 15 soul is hard to get? Is it? If you are following my posts, I have shown you how easy to get the 15 soul with reijy by turn 5 or 6. Its not that hard you know. Anyways speaking of reijy effect, its simply very consistent with the +2 criticals as long it has a 15 soul under him. 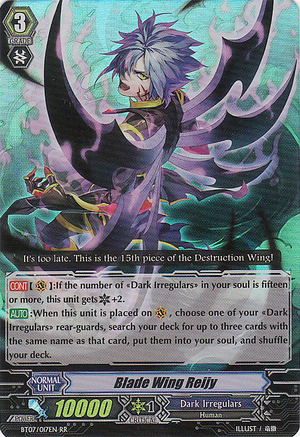 Means opponent will get pressure to guard him every turn which is similar to perfect raizer. Whereas what i feel makes reijy strong is its consistency. However its lack of power, cause it to be quite easily guarded by units and opponent need not always need to throw a perfect guard to defend against him. Do look out for my new post where we compare more new cards to what we already have. and also bt11 supports and releases.